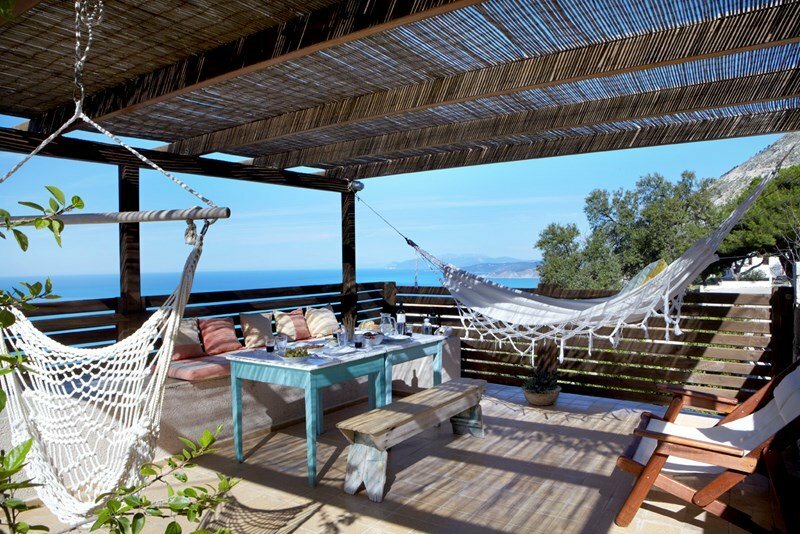 Imagine that you enter the courtyard of the villa and welcoming two red hibiscus, hammocks, throw cushions and great views. Going down the main stair to the pool, the horizon still to be with the blue of the pool and the view is breathtaking. Entering the house you are in a single dining room with fully equipped kitchen and large table to welcome traditional delicacies. At a lower level, the comfortable living room waiting to rest on two sofas, one built with stones from an old mansion house on the island and an old wooden with traditional mattresses and pillows, group of them and a leather armchair. Six windows let in light and views to come home. In the same room is the bathroom and the first bedroom, the "pink". Romantic, light atmosphere with an iron bed with a mosquito net, bathroom with bath and a large antique mirror and balcony in the shade of an olive tree two hundred years. The paintings and most household objects are selected from the personal collection of owners with taste and style. Going upstairs from the white wooden staircase impressed by the high ceilings, sunny patio and large chandelier. The staircase leads you to a hallway and two shared balconies, one overlooking the mountain and the other at bay of Myrtos. Here are 2 bedrooms, a "blue" and "green" and the two independent with their own bathroom and balcony with a western orientation. The "green" has two sites in one bedroom and the other in a large three-seater sofa with cushions that can be used as a single bed and kitchenette. The "blue" bedroom, beloved by children, hiding in a small sitting area attic that can also be used as a bedroom and sleep up in comfortable layers two more people. The view from up there at sunset is magical. Going down the stairs going to the basement that is decorated with very old furniture, family heirlooms, as a setting typical Ionian bedroom. In the basement bathroom can enjoy a relaxing bath in Jacuzzi cabinet. Outside is a stone guest house next to the pool, built of stones from the ruins of the old mansion. The traditional technique inside, gives a simple but mysterious atmosphere. Using the same technique has been built the bed and the bath. The guest house also has a kitchenette and sofa bed. Imagine a small place that the history, diversity in nature, 300 beaches and good food offers you the vacation you dreamed. Aghia Kiriaki: 1500m long with a lot a morphological variations, quiet, with just a few sunbeds and a canteen (2,5km). Fteri: white pebbles and green forest. Accessible only by boat from Aghia Kiriaki crystal clear waters, unforgettable experience. Aspros Gialos, Gianiskari Cave: Accessible only by boat from Aghia Kiriaki. Amidi: the beach of the gulf that is furthest. Impressive as the green foliage of the trees dives into the sea. Accessible only by boat from Aghia Kiriaki. Olive harvest. An experience that remains intact through the centuries. Fishing with the local fishermen. Vine harvest. A pleasant summer activity. - Go back in time by visiting the earthquake remains of Agonas. Visit also the church of the village on the15th of August, for the fiestas. - Go on a boat ride and visit the Melissani cave (20km). - Take a walk at St. George’s Castle, enjoy the wonderful view and go for art shopping. - Island shopping at Fiskardo. - Visit Lixouri for traditional ice cream (20Km). - Have dinner, drinks and go dancing at Argostoli. - Take an afternoon stroll at Assos, walk around the castle and have ouzo on the beach. - Have fresh fish at the little port of Aghia Kiriaki. - Enjoy the most beautiful sunset from the balcony of the Kipoureon Monastery. FACILITIES Imagine a rich breakfast with apricot jam, just like granny used to make, fresh eggs from the village and freshly baked bread. In the refrigerator of the villa you will find traditional local products (eggs, cheese, jam, freshly gathered fruit and vegetables) in order to prepare the breakfast you prefer. You can also get bread from the baker that passes by every morning and leaves fresh loaves.